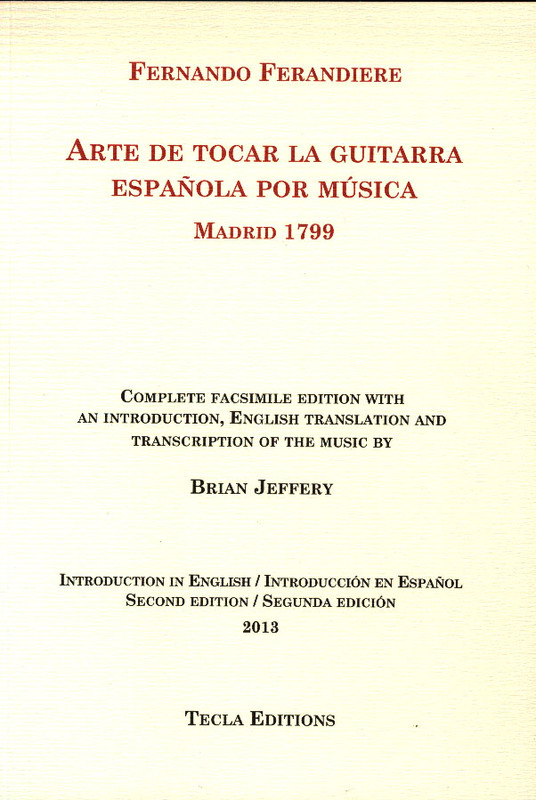 An interesting and enthusiastic book about the guitar from Madrid, 1799. – a complete facsimile reprint of the Madrid 1799 edition. – a new introduction of forty pages by me (Brian Jeffery) in both English and Spanish which brings our knowledge of Ferandiere up to date to 2013 and adds new information which is currently not available anywhere else. The complete text of this new introduction is printed in English, and then the complete text of the introduction is given again in Spanish. – a complete English translation of Ferandiere’s text. – and the musical examples from the original appendix, here also given additionally in modern notation. 181 pages. 16 x 23 cm (paperback size). The new Tecla edition of Ferandiere’s Seis Dúos.